The month of Ramadan has come and gone in Egypt, and with it the annual feast of post-Iftar (fast-breaking) television serials. This year’s audience favorites included “Taht al-Saytara” (“Under the Influence”), a family drama about heroin addiction and recovery with a talented cast, high production values, and upper-class settings. Based on meticulous research and hours of interviews with users in recovery, the series realistically depicted the anguish and insanity of drug abuse but also ended with hopeful and heart-tugging scenes of family reconciliation, forgiveness, and the possibility of recovery. In the international English-language press, the Egyptian serial that garnered the most attention this Ramadan season was “Haret al-Yahud” (“The Jewish Quarter”), a melodramatic Muslim-Jewish love story set around the time of the founding of the state of Israel. Starring the talented and beloved Menna Shalabi, “Haret al-Yahud” was distinguished by its representation of the majority of Egypt’s mid-century Jewish community as patriotic Egyptians, rooted in their local neighborhoods and devoted to Egypt, rather than anti-Arab, Israel-loving Zionists. But the series also provided endlessly entertaining opportunities for viewers and social media lovers to ridicule its historical inaccuracies and anachronisms, as astutely described by Mohamed El Dahshan in a recent piece for The Tahrir Institute for Middle East Policy’s website, “The Jewish Quarter: A Missed Opportunity”. As El Dahshan also rightfully points out, the series omits entirely the state’s role in expelling its Jewish community, glorifies the Egyptian military as savior of the nation, and frames the Muslim Brotherhood as the primary source of national dissension and disunity. For readers familiar with Walter Armbrust and Lila Abu-Lughod’s scholarship on Egypt’s long history of Ramadan television serial production, the themes and aesthetic features of “Taht al-Saytara” and “Haret al-Yahud” will strike a chord of recognition: love stories and family dramas; dangers posed by drug abuse and other social ills to family and youth; vilification of Islamists; the problem of sectarian tensions and the preservation of national unity; melodramatic dialogue and scenarios that elicit empathy and strong emotions; and clothes and sets that project an image of Egypt as clean and comfortable and modern. But this Ramadan season I found myself drawn to another series, “Al-Ahd” (“The Covenant”), which belongs to a very different universe of tropes and aesthetics. According to its screenwriter, Mohammed Amin Radi, whom I spoke to in Cairo this summer, “Al-Ahd” is Egypt’s first fantasy television drama. Directed by Khaled Maraie, it is the pair’s third collaboration, following their much talked-about serials “Niran Sadiqa” (“Friendly Fire,” 2013) and “El-Saba’ Wasaya” (“The Seven Commandments,” 2014). As a team, Radi and Maraie have gained a reputation for creating Ramadan serials that chart new territory, and “Al-Ahd” was received with curiosity and some confusion by audiences and critics. Set in a time and place that is mythical but that clearly invokes the landscape and dress of the Upper Egyptian countryside, “Al-Ahd” is a drama about the ruthless struggle for power between and within the ruling families that seek to control three territories: Kafr al-Niswan, Kafr Natat al-Hayt, and Kafr al-Qal’a. Thus, like many Egyptian serials, it is also a family drama, but in a skewed and perverse way. In the opening scene, a woman, Gumar, and her lover, Khalil, poison a man that we later learn is her husband and his brother. A small child, Mehib, the son and heir of the murdered man — the head of the Al-Diyaba family and the ruler of Kafr al-Qal’a — witnesses the crime and flees the scene; he will later acquire the power to kill with the mere touch of his hand and return to take his revenge on his mother and uncle. In the second episode, we witness the character Segag kill her mother with her own hands and preside over the slaughter of her brothers in her bid for power in Kafr Natat al-Hayt. And in the third episode, we watch as the beautiful Raya performs a dance for the ruler of Kafr al-Niswan that ends with her stabbing him in the heart and taking his throne for her own. As the series progresses, plot details dizzyingly multiply, bodies pile up, and alliances are made and unmade without scruple. Men and women are equally power-hungry and strategic. Through a series of flashbacks and reminisces and prophetic visions of the future, we learn that the events depicted in the serial are but one more episode in a long struggle between these clans and their family members….there is no beginning and no end. As we are introduced to more and more characters, and as we learn more and more about them, we learn that each of them, even the most nefarious amongst them, has been wronged in some way; each of them seeks to right that wrong, to avenge their honor and their dead, and to gain or return to power in order to restore their dignity and their rightful place in their families and in the order of things. And in turn, characters that we thought of as righteous at the beginning of the series are later revealed to have played a hand in the injustice suffered by those who now do wrong in the name of restoring their rights. Here, love of power and a willingness to attain it by any means, as well as the abuse of power once attained, mingle easily with talk of lost dignity and restoring rights and avenging the dead. 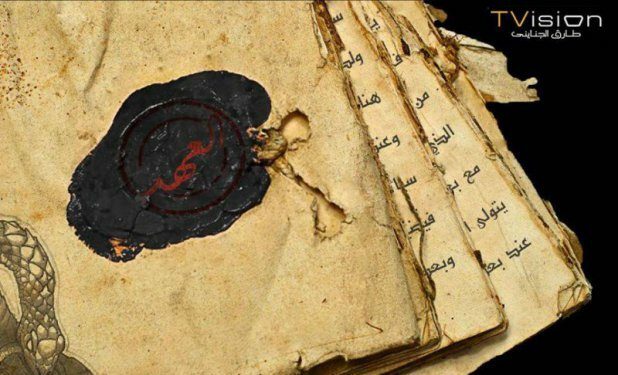 The title, “Al-Ahd,” refers to an obscure parchment that purportedly contains within it a record of the ancient laws and customs of the land, as well as prophecies for the ages to come. We learn nothing about the circumstances of the revelation of this covenant, and, in-keeping with Montaigne’s idea of the mystical foundation of the authority of laws, this manuscript exerts a strange power. Although nobody seems to have read it or seen it, the people of the land believe it to be in the physical possession of the rulers, and they are waiting for one of its prophecies to be fulfilled – the arrival of a young woman, from the prominent Al-Diyaba clan, who will restore justice to the political and social order. When the guardian of the manuscript, Estamanoha, flees with it after Gumar and Khalil’s coup in Kafr al-Qal’a, this precipitates a crisis of political legitimacy. The new rulers and their allies are no longer in the possession of the parchment, and so they decide to write a new one. By the end of the series, numerous copies of the covenant are in circulation, and multiple characters claim to be in the possession of the real one. Likewise, several women have claimed to have been the fulfillment of the prophecy. In the final scenes of the series, we see characters racked with doubts — is there an authentic copy of the covenant? What does it really say? Is there truly a woman who will appear to fulfill the prophecy? And in a final cruel twist in the last episode, the satanic character Ubay visits the spirit of the now-deceased Estamanoha and reveals to her that it was actually he who wrote the covenant in order to illude the clan of Al-Diyaba and turn its members against one another. As with the covenant, so the serial does with almost every other sacred value or principle meant to safeguard justice and rights and humane social interactions. Blood ties, family bonds of love and affection, and romantic love: these are turned into instruments of strategy and manipulation and readily discarded for the sake of political gain. Children turn against their parents and parents against their children, and characters fake tender emotions in order to manipulate or keep up appearances. Religion is a tool of the powerful, and customs and conventions fail to protect the vulnerable. “The people” can also be used as a means to acquire power, and then they recede once again into the background. Kind-hearted characters, including the beautiful Sahar, who has the power to heal with her hands, become pawns in the games of the powerful, and her miraculous gift is used as a means to bestow legitimacy on unjust rulers and keep the people oppressed. After she decides to sacrifice herself for love at the end of the series to cure her beloved Mehib, he leaves her on her deathbed to confront the ruthless al-Dawi, who immediately kills him; her romantic sacrifice has meant nothing, and both she and Mehib die without defeating their enemies. Thus “Al-Ahd” is far from the world of conventional nationalist melodramas or series about social ills afflicting the youth. As entertaining television, “Al-Ahd” has it all: characters with superpowers, miracles and black magic, bastards and babies switched at birth, treason and betrayals and a high body count, irreverent ghosts that refuse to exit the world of human affairs, flirtatious song-and-dance numbers, and a gorgeous, star-studded ensemble cast with some of the Arab world’s most beloved actors (including Ghada Adel, Asser Yassin, Arwa Gouda, Ayten Amer, Kenda Alloush, Hana Shiha, Seba Mubarak, Sherin Reda, Salwa Khattab, and Ahmed Magdy). It is also replete with references and allusions to Egyptian folklore, Qur’anic stories, and contemporary political events (including the atrocities of ISIS). Many critics and viewers noted its similarities to “Game of Thrones,” a comparison which the screenwriter Amin Radi attributed in various interviews to the generic nature of fantasy as a fictional form. Setting aside the question of imitation or adaptation, the obvious similarity between the shows suggests that we live in a moment in which Machiavellian and mythological representations of the struggle for power convey something honest about the precarity of our time while also titillating us, in a way that we love. There is one set of characters in “Al-Ahd” that I have not yet mentioned and that serve as foils to the ruthless power struggles of the great families. These are the ‘awalim – funny, joyful, irreverent-mouthed singers and dancers, and their poet-ally ‘Alaa, who remain humane and loving and who strive for truth and the good, even when they are persecuted and martyred for it. They are entertainers, but they alone bring to light the hypocrisy of the powerful. And this is so not only because they sometimes raise their voices against them, but because the way they live stands in vivid contrast to the narrowness and inhumanity of lives lived in the pursuit of revenge and power. When I spoke to Amin Radi this summer, I asked him about these characters, and he told me that for his generation that came of age in the 2000s, there are no ideologies and no heroes left. Arab nationalism, Nasserist socialism, Islamism, popular uprising and revolution: none of them have any credibility any more, and nor do the intellectuals or political activists who championed them. So what is it that remains for us? A collective turath (heritage) of language, proverbs, folkloric characters, religious texts, films, songs, and images that is deep-rooted and often unconscious. This is what the artists and singers and poets and entertainers do: they take this heritage that is our collective memory, and they use it to find their own way in the world. They mess with it and play with it and rework it, and out of this they make something that feels both universal and perennial yet uniquely of their own place and time. This is what “Al-Ahd” strives to do. And curious and delighted viewers, including this one, can look forward to the continuation of this experiment when the second part of the “Al-Ahd” series appears in Ramadan of 2017.